Wipes are ready-to-use, disposable disinfecting towels for rapid disinfection (depending on the manufacturer, effective already after 1 minute). Near patient surfaces such as bedside tables, bedsteads, electricity outlets, remote controls, telephones etc. Disinfection wipes for surface disinfection in healthcare facilities, hospitals, pharma industry, food production environments and many other application areas can be either ordered directly from manufacturers, commercial agencies or in hygiene or disinfection online shops. 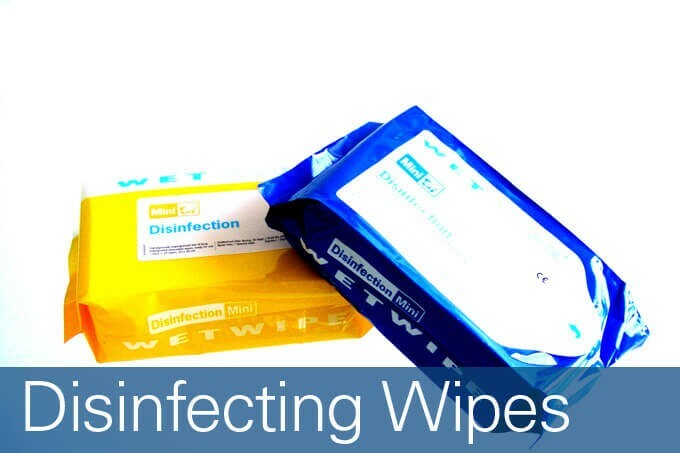 Wipes are usually available in various packaging sizes such as small bags with 48 individual wipes or in big buckets for the dosage with disinfectant refill packs. Christian Weckler is a hygiene specialist and also a state approved disinfector working at DIOP GmbH & Co. KG which is a Germany based company specializing in room disinfection. Christian is responsible for international sales and business development. Put your e-mail and click on the envelope button to receive our disinfection newsletter. © Copyright 2016 DIOP GmbH & Co. KG | All rights reserved.